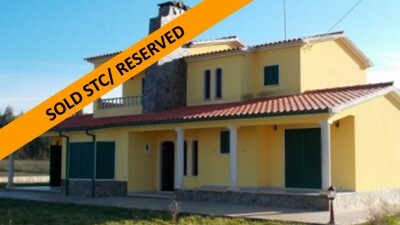 A four bedroom detached Villa, with land for sale near Tomar, central Portugal. The house, which is set over two floors, is connected to mains water and electricity, has central heating and is fully double glazed. At the lower floor there is a good size kitchen that is fully-tiled and is situated at the rear of the house and has a range of built-in base and eye level wooden units and a tiled floor. Of the kitchen there is a triple aspect living room, there is also a separated dining room, a storage room a family bathroom and a utility room. There are two bedrooms to this floor and one is en-suite. On the first floor there is one other big living room that could be a games room, and two good size bedrooms. All the windows are double glazed and there are outside shutters, and there is central heating installed. Behind the house there are two garages, storage, and an outside barbecue area. The property is all fenced and walled, and there are several different fruit trees. There are patios all around the house and driveway to the garages, The gates are automatic both in the entrance of the property and in one of the garages. There are neighboring properties in the vicinity though none too close to impede privacy within the garden. The property is situated in the small hamlet of Bairrada, which is around 10 minutes drive from the historic town of Tomar. Tomar is a bustling and interesting market town with a wealth of restaurants, shops, cafes, bars, shops, supermarkets, banks, pharmacies, schools and university as well as hospital, bus and train station, sports centres and historic monuments. Tomar is also home to the UNESCO listed Convento do Cristo, constructed by the Knights’ Templar in the 12th century. The closest airport to the property is located at Lisbon, which is around one and a half hours’ by car. Lisbon airport is serviced by a variety of low cost airlines which operate regular flights into and out of the United Kingdom and other European countries. or use the following form! would you like us to contact you per telephone?